During my Summer Home Tour last week, I showed my new entry hall, but I never had a "BIG REVEAL". So even though technically the new entry has already made its debut on the blog, I still wanted to give it a true reveal. I hope that even though it's already been seen, you might be interested enough in the details to give this post a read. Without further ado...the new entry hall. And just for fun, here's a side-by-side BEFORE and AFTER. So I designed just what I was looking for. A console with a modern feel and clean lines that was larger than the one we had. I did love the gray color I painted the previous console (Martha Stewart's Magnetite) so I chose to paint the new one the same color. But that's where the similarities end. The hubby started to build the console and my cute Papa finished it. 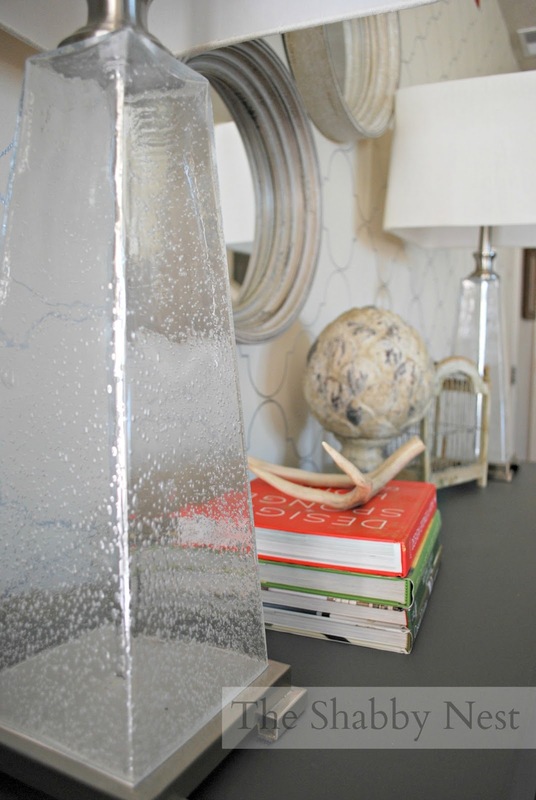 I love the contrast of the natural textures against the more contemporary console. 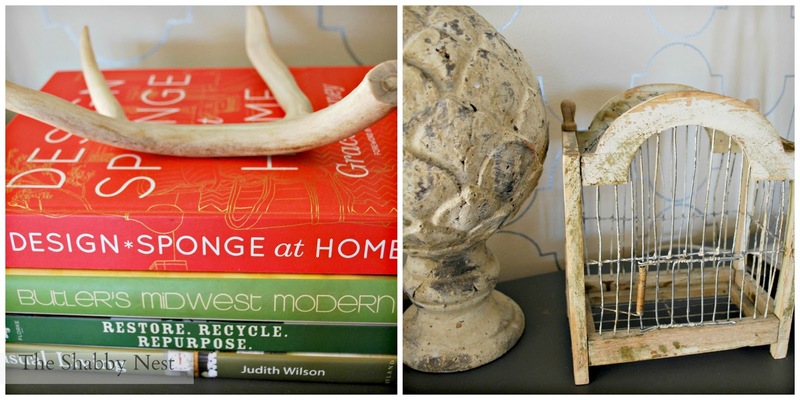 The antler is vintage from my mom, as is the old birdcage. The finial was something I picked up at Tai Pan here in Utah. The design books add a nice pop of color. I got the bubble glass lamps for a song from the design showroom I used to work for. 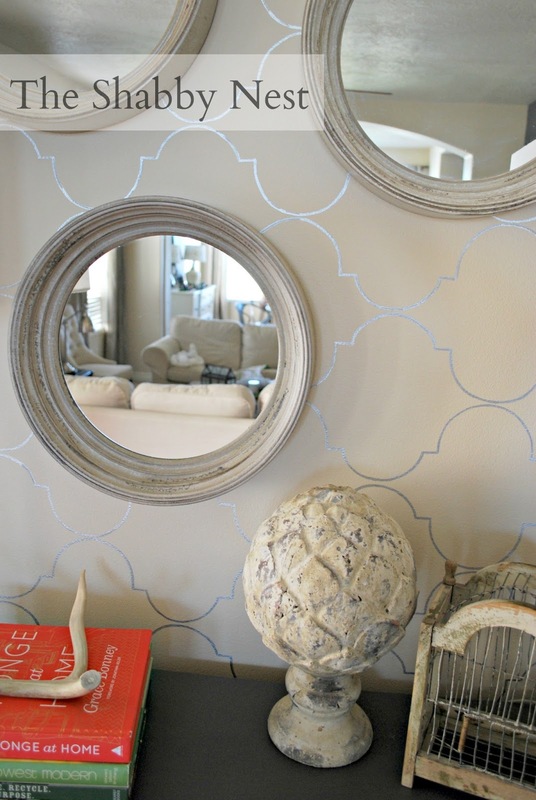 The porthole mirrors are from the new Threshold line at Target. I love the idea of using three mirrors instead of the typical single mirror. They still provide the light I need on that side of the room, but they are a bit unexpected and much more interesting. I just love how it turned out. 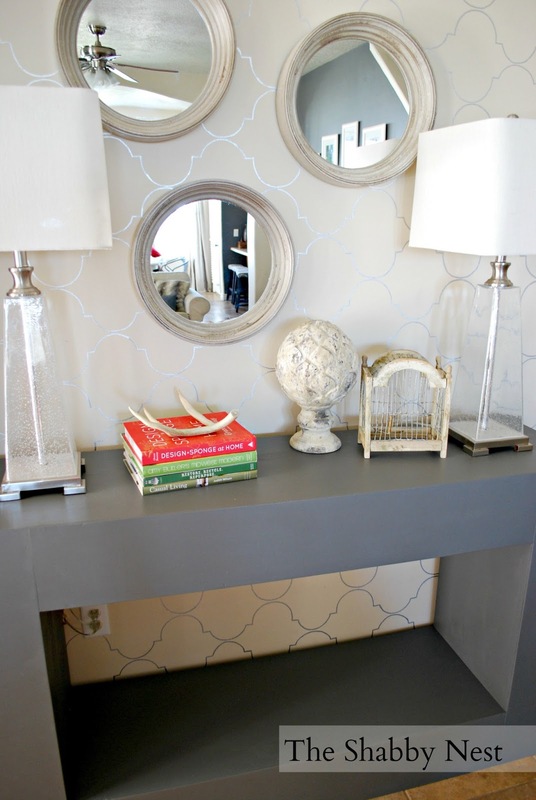 Trouble is...having a bright new entry, has me figuring out ways to redo the living room. Again. Sheesh. Such is the life of a designer. Lol! Beautiful! I love the clean, modern look you've created. 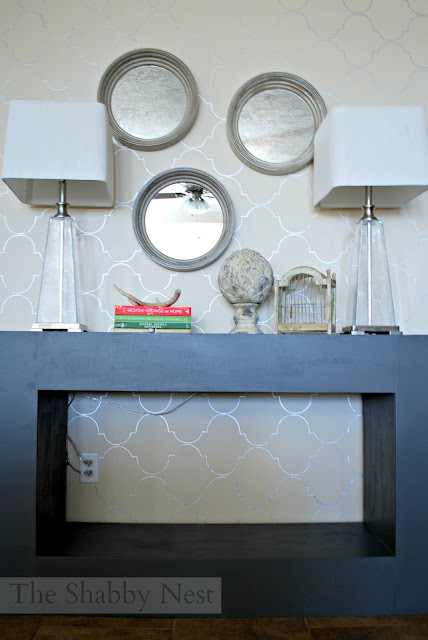 Love the lamps and the mirrors - they work so well together and really work with the stenciled wall! Very nice! 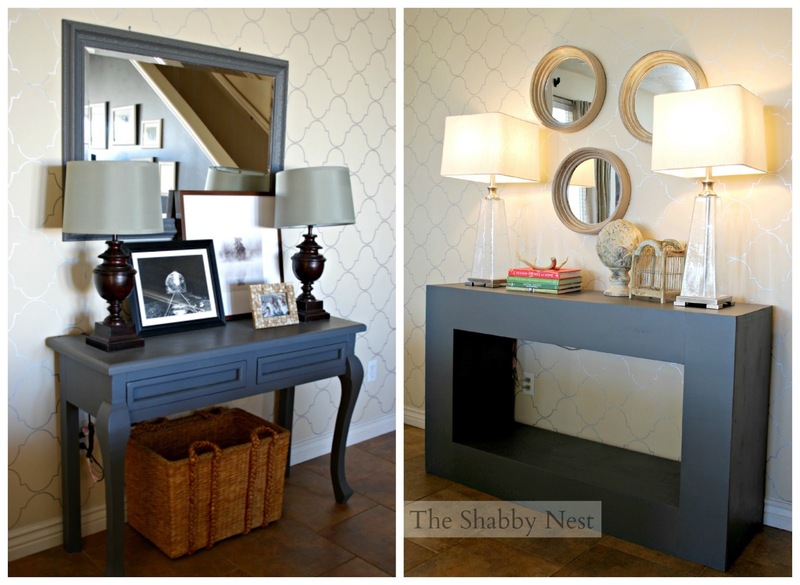 Love the lamps and the mirrors! I love the non-traditional look of the mirrors too! It looks great! This is beautiful! You did a great job! I pinned! Love it! It really makes the room feel Bright! You are such a sweet person, with amazing beutification skills! Your entry turned out FABULOUS just like you! I think you should post a tutorial on that table, I kinda want to make one!